I myself did not realize that there is actually a way to find nutritious vegetables at the supermarket that goes unnoticed by most people. As a common knowledge, usually, I choose vegetables with characteristics of freshness such as those with lively and bright color and crispness, especially for potato, tomato, carrot, and radish. However, scientifically, I was somehow wrong in choosing vegetables. Let's take the case of carrot. When choosing carrots, we usually choose the bigger ones, with leaves and root that are brightly colored, and without cracks around the red root. But you should not be tricked by the carrot's texture, color, and distinguishable look. As shown in the image above, carrots with smaller cores (the core is the fibrous center that runs the length of this vegetable) are sweeter and the better ones. You won't be able to see the core until you cut it open. Therefore, look for carrots that are thinner or smaller at the top. Usually, this shows that it has a smaller core. The carrot's natural sugars are located in the outer layers. A smaller core will mean that there are much more outer layers of sweetness and more nutritious parts. In addition, it is a common mistake to peel off the carrot skin. The most important nutrition, beta-carotene, is present between the peel and the core. The carrot peel contains twice the amount of beta-carotene and four times the amount of sucrose than the carrot's core. 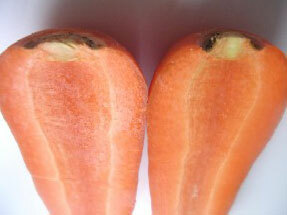 Unfortunately, most carrots sold in the markets have their skin already peeled. Sadly, most people throw the leaves of carrots. The leaves contain as much as four times more nutrients than the root. You can make use of the leaves by heating it with slight olive oil, and use it for salad for your morning bread. 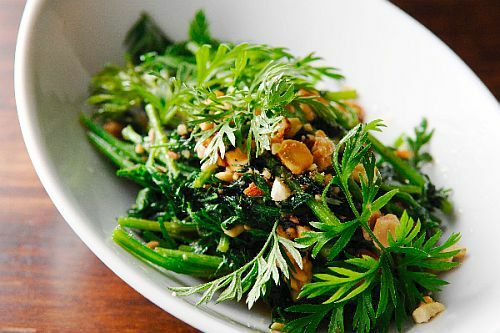 There are a hundreds of cooking recipe using carrot leaves. Raw carrot juice including its leaves can help lower your cholesterol and high blood pressure. It is recommended to drink about two glasses of it every day. In future articles, we will be listing more of these good stuffs together with potato, radish, taro, and many other common vegetables available in your backyard garden or near your shopping centers. The world's longest carrot was recorded in 2007, and it was a gigantic 5.841 metres (19 feet 1.96 inches) long. 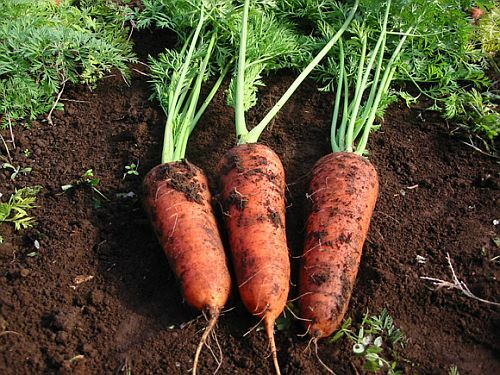 The world's heaviest carrot was recorded in 1998, and it was a whopping 18.985 lb (8.61kg), single root mass of weight. Carrots were first grown as a medicine, and not as a food. In a lifetime, the average person will consume 10,866 carrots. Among all vegetables, carrots have one of the highest content of beta-carotene (vitamin A). You get between 175,000 and 450,000 carrot seeds in one pound. A teaspoon can hold approximately 2000 seeds!